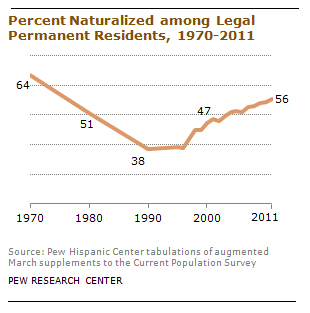 According to Pew Research Center estimates, the share of all foreign-born legal permanent residents who have become naturalized U.S. citizens rose to 56% in 2011, the highest level in three decades and an 18 percentage point increase since 1990. That represents a population of 15.5 million naturalized citizens, an increase reflecting both a rise in the annual inflow of legal migrants and an increased likelihood that those who are eligible to apply for citizenship actually do so. The rest of those eligible to apply for citizenship — 12.4 million — are green card holders who could eventually naturalize and become U.S. citizens.